A government-funded £31.3m ferry terminal will give the Isle of Man "full control" of its "lifeline" sea links to the UK, a minister has said. The Manx government has been granted planning permission for a new terminal at Liverpool by the city's council. Infrastructure Minister Ray Harmer said the decision would allow people to "make plans with confidence". The facility is due to open in late 2020, subject to Tynwald approval of funding for the project. 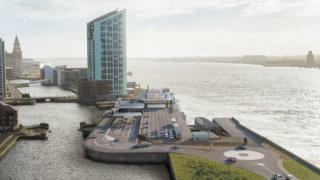 It will be built at Princes Half Tide Dock, about 800yds (730m) from the existing terminal at the city's Pier Head. Vehicles and freight will be served by a £7.6m link road, funded by Liverpool City Council. Mr Harmer said the new terminal "will enable the Isle of Man government to have full control over its lifeline sea links to the United Kingdom". "This news will allow residents and businesses to make plans with confidence," he added. Liverpool Mayor Joe Anderson said the island and the city "have a historic relationship and this new ferry terminal will cement our strong links and forge even closer ties into the future".